£)g3 e5 13 0-0 exd4 14 ¿hf5 Wd8 15 £>3xd4 <^e5 16 i.b3 ±xf5 17 ^xf5 Wb6? 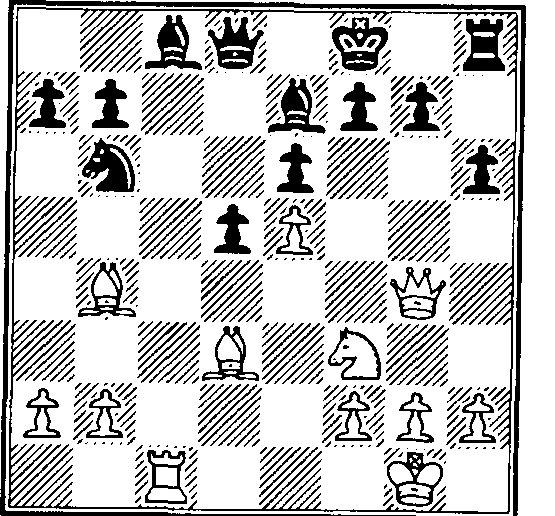 An astonishing error by Lasker that allows White's queen to disturb the coordination of Black's pieces. Correct was 17...Wxdl 18 Sfxdl Had8 19 ¿bd6 fid7 with a passive but defensible position. 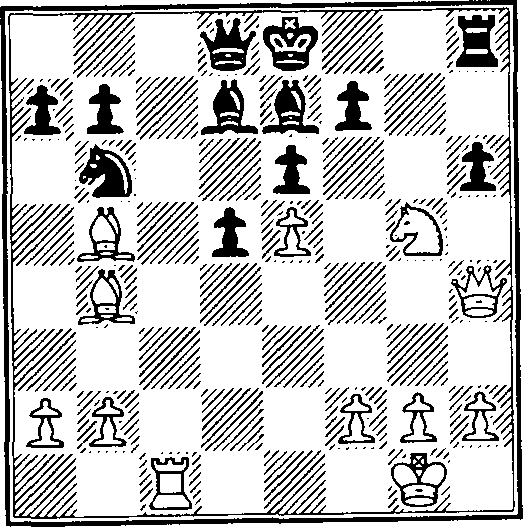 Alekhine forces concessions in Black's king position. The knight does many things here besides attacking f7 - it also supports the advance e4-e5 and keeps Black from simplifying on the d-file. 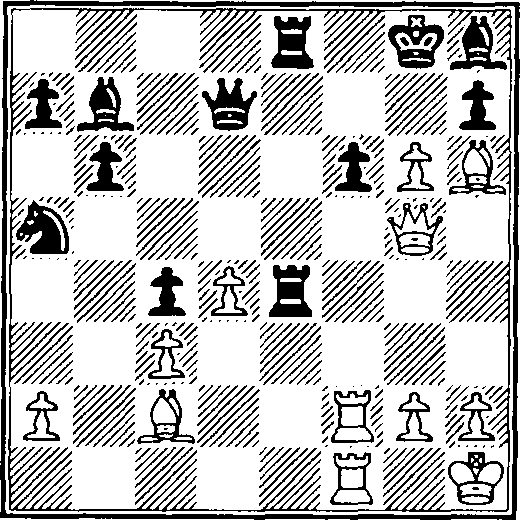 Mikhail Tal gets a little taste of his own attacking medicine courtesy of a fellow attacking genius. White's seemingly extravagant opening idea to stop Black from castling (the sequence leading up to 15 £}h6) led later to a merciliess attack as Tal was never able to get his king out of the line of fire. Now comes the first of many sacrifices to keep Black's king in the central hot seat. Also 18...i.xd5 19 exd5 £>d4 20 Wf2 Wa7 21 Ae3 Ah4 22 #xh4 £iO+ 23 ±xf3 Wfxe3+ 24 &g2 wins for White. 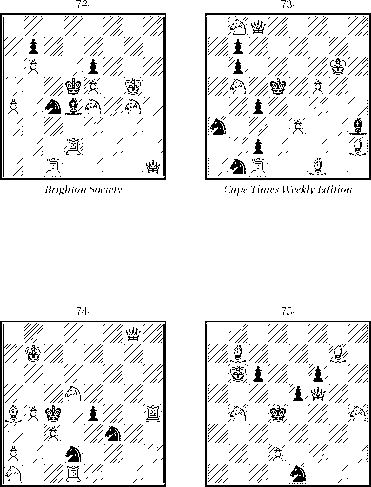 Black's main pillar holding up his position is demolished and White's queen hungrily takes over a commanding, centralized position. 1 d4 2 c4 g6 3 <Sk3 d5 4 cxd5 ^xd5 5 e4 ^xc3 6 bxc3 £.g7 7 JLc4 c5 8 ^e2 0-0 9 0-0 &c6 10 ±e3 Wc7 11 Bel Hd8 12 f4 e6? 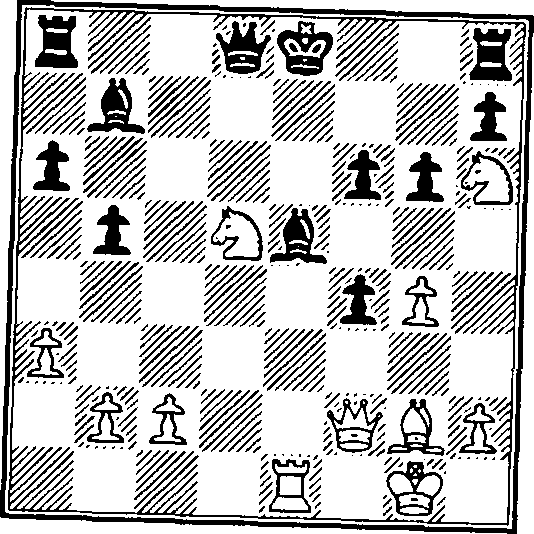 A good preparatory move to eliminate tactics based on the a7-gl diagonal. White is now free to play moves like Wei and £\g3 with a clear conscience. 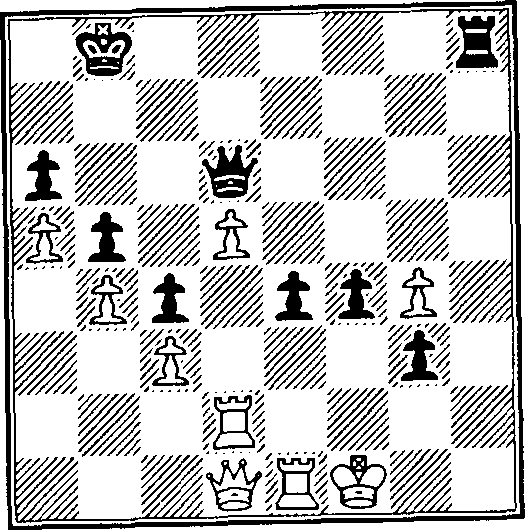 White carefully masses his forces for the kill while keeping a careful eye on Black's potential counterplay on the long diagonal and the e-file. 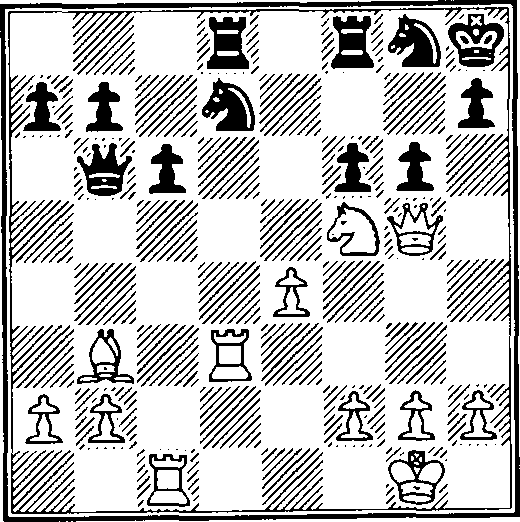 Black has no chances to defend if he agrees to the exchange of this lonely defender of his king. 22...Sde7 23 fxg6 hxg6 24 Sel+ 25 Afl f5 26 Wg3 <S?h7 27 £ixe8 wins for White. 23 i.c2 Sde7 24 Bcfl! 24 fxg6 hxg6 25 Bcfl f5 26 Sel 27 Wg3 S8e6 28 foxbl foxbl 29 Axf5 Bxfl+ 30 Sxfl Bf6 31 Ag5 Sxf5 32 Sxf5 gxf5 33 JlflS+ 4f7 34 £xh8 We4 35 Wg7+ <£>e8 36 Wg6+ <&d7 37 Wf7+ <£c6 38 Wxc4+ £>c5 39 h3 leads to an ending in which White is two pawns up. But Geller does better than that. 21..±d5 28 2xf6 £xf6 29 Wxf6 hxg6 30 #xg6+ <&h8 31 ®h5 <4>g8 32 £xe4 ±xe4 33 2f4 with 2g4+ to follow. 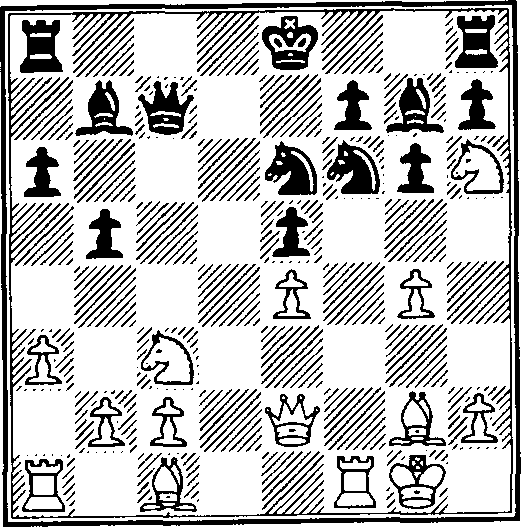 28...£xf6 29 Wxf6 hxg6 30 Wxg6+ <&h8 31 Wh5 <4>g8 32 &xe4 &xe4 and again the rook lift - 33 2f4. 1 d4 £tf6 2 ^D e6 3 &g5 d5 4 £>bd2 &e7 5 e3 ^bd7 6 i.d3 c5 7 c3 b6 8 0-0 ±b7 9 <£ie5 £>xe5 10 dxe5 £kl7 11 ±f4? 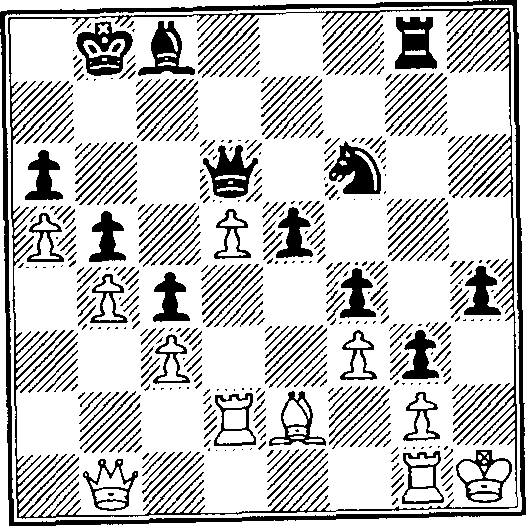 Correct is 11 &xe7 #xe7 12 f4 f6 13 ®h5+ g6 14 exf6 with a roughly equal position. Better is 15 h3 c4 (15...g4 16 hxg4 hxg4 17 £ih2 <£ixe5 18 £>xg4 i.d6 19 £b5+ <4>f8 20 bxc5 bxc5) 16 £c2 0-0-0 17 &d4 a6 18 f4. This ensures that all files on the queenside will remain shut. 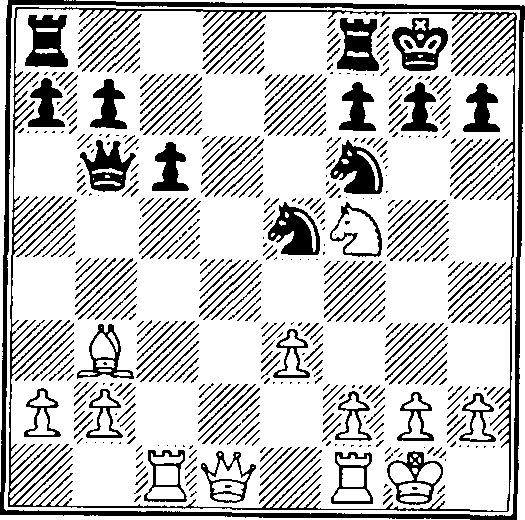 If White tries b4-b5, Black answers with ...a6-a5. If White plays a4-a5, Black closes it with ...b6-b5. White's brief run of activity has ended and he must suffer from a relentless advance of Black's foot soldiers from here to the end. 28 i.xd6 Wxd6 29 fid4 e5 30 ld2 f5! 31 exd5? 31 exf5 #f6 was little better. 41...#d7 was the butcher's method of winning. Petrosian clearly wanted his infantry to claim the prize. 42 fxe4 £>e3+ 43 Sxe3 Shl+ 44 &e2 Sxdl 45 fixdl fxe3. Another way was 42...Shl+ 43 &g2 Sh2+ 44 *fl #h6 45 Sxh2 «xh2 46 Wd4 g2+ 47 &e2 gl=»+ 48 &dl Wxd4+. 43...Shl+ 44 Sgl ®h6 forces mate a bit faster, but of course the text is overwhelming. 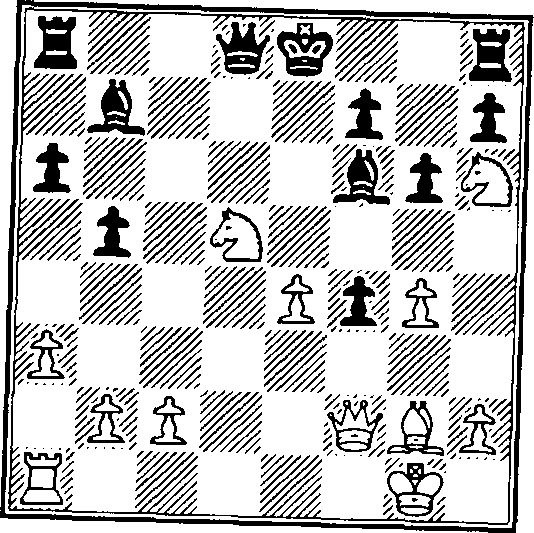 Spassky resigned in view of 44 <èe2 (44 <4>xg2 Sh2+ 45 <i>gl Wh6 quickly forces mate) 44...Wf4 45 #d4 WO+ 46 <i>d2 Wf2+ etc. Wb6 8 0-0 cxd4 9 cxd4 £}xd4 10 ^xd4 Wxd4 11 Wb6 12 Wa4 #b4 13 Wc2 h6?! 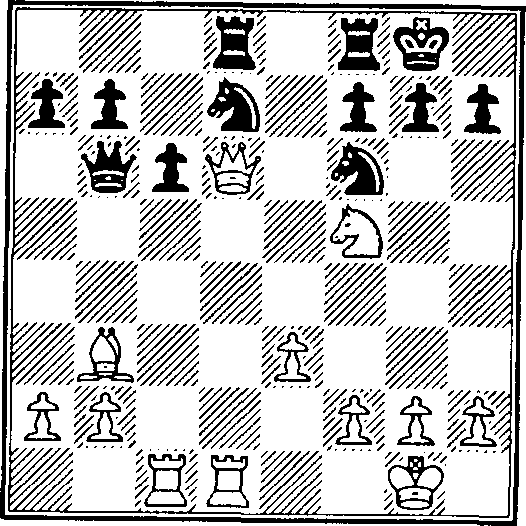 Black has serious difficulties developing his queenside. 22...&xb4 23 #xb4+ #e7 (23...<4>g8 24 a4! is strong) 24 «xb6! favors White. 22...&g8 23 ¿xe7 Wxe7 24 a4 i.d7 25 a5 &a8 26 Wd4! (there is that centralizing theme again) 26...b6 27 axb6 axb6 28 Sal #e8 29 Sa7 gives White more than he could ask for in return for the measly pawn.